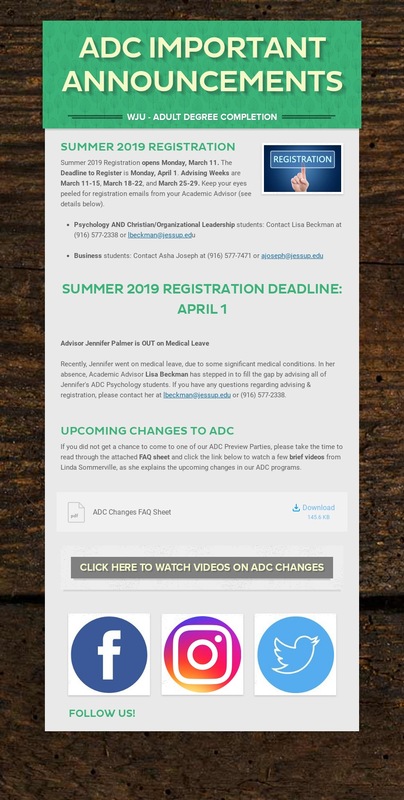 Students withdrawing from a course must submit a Petition to Drop form to the ADC Office. Students who submit a Petition to Drop before the first class session will not receive a penalty and the course will not appear on the student’s permanent transcript. Students who drop a course after the first class session ends will receive a W on their permanent transcript. The Petition to Drop form is to be submitted to either the University Academic Office or the local ADC office. The effective date of the drop will be the postmark, fax date and time (original must follow by mail), or date and time received personally by University staff. Failure to withdraw from class by submission of a Petition to Drop will result in an F being entered on the permanent transcript for the class and any refunds for the class are forfeited. A student who has officially dropped a class and who is no longer registered for credit or for audit is ineligible for further attendance in that class. Dropping a class may affect the student’s financial aid. It is the student’s responsibility to contact the Financial Aid office for information.